This is the performance cruiser other bikes wish they were. The dark and muscular M109R B.O.S.S. has a powerful V-twin engine using some of the largest pistons in the industry — a bike that will get your adrenaline flowing whenever you ride. This 109 cubic-inch engine is wrapped with aggressive blacked-out styling that includes slash-cut mufflers, drag-style bars, a supplied solo seat cowl, and a distinctively shaped headlight nacelle that’s uniquely Suzuki. This bike is not just about looks as stout inverted forks, a hidden single-shock rear suspension, and an ideally designed saddle delivers responsive handling and an exceptionally comfortable ride. Performance never looked so good, or so dark. Huge 4.4 inch (112mm) forged aluminum-alloy pistons. These are one of the largest reciprocating gasoline engine pistons being used in any production passenger car or motorcycle, while featuring a race-proven design to reduce friction and inertial mass. Each of the large cylinders is lined with Suzuki's race proven SCEM (Suzuki Composite Electrochemical Material) for optimum heat transfer, tighter piston-to-cylinder clearances and reduced weight. Suzuki's class-leading electronic fuel injection system features the Suzuki Dual Throttle Valve system (SDTV) with 56mm throttle bodies, which maintains optimum air velocity for smooth low to mid-range throttle response. 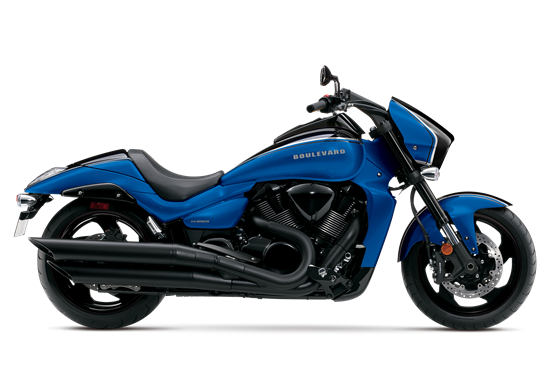 The 2-into-1-into-2 stainless steel blacked-out exhaust system features Suzuki's digitally controlled SET (Suzuki Exhaust Tuning) system for optimum engine performance and a powerful V-Twin sound. Blacked-out exhaust system, clutch cover, magneto cover, cylinder head covers, air cleaner cover and final drive case. The long-stretch fuel tank holds a full 4.9 gallons of fuel. Blacked-out handlebars, clutch and brake levers, handlebar switch cases, rear view mirrors, fuel tank/instrument cover, front and rear wheels, front and rear brake calipers, frame side covers, rear fender stays, side-stand, steering stem clamps and front forks. The massive 240/40 x 18 is the widest rear tire ever used on a Suzuki motorcycle. Blacked-out, inverted front forks feature race-proven cartridge internals with 46mm stanchion tubes and provide 5.1-inches of smooth wheel travel. Cast aluminum-alloy swingarm works with a progressive linkage and a single rear shock absorber; adjustable spring preload to suit rider and passenger weight. Twin front fully-floating disc-brakes with dual-piston calipers and a single-disc, rear brake with a single dual-piston caliper are ready to haul the bike down from speed. Both rider and passenger seats are made for comfort as they allow freedom of movement and accommodate riders of diﬀerent sizes, and are well cushioned. Clear taillight and turn signal lenses.